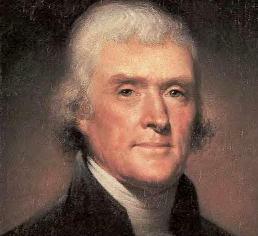 "The Wisdom of Thomas Jefferson"
we shall become as corrupt as Europe. who are willing to work and give to those who would not. It is incumbent on every generation to pay its own debts as it goes. A principle which if acted on would save one-half the wars of the world. of taking care of them. disbelieves and abhors is sinful and tyrannical. 'I believe that banking institutions are more dangerous to our liberties than standing armies.